From the website of SEIU Healthcare Illinois, Indiana, Missouri and Kansas. A one-day strike by a small band of child care workers in Chicago again poses difficult questions that the nonprofit sector struggles to answer. Is the financial stress an organization faces reason enough to ask employees to accept inadequate pay? Are the values an organization upholds in support of its clients different from those it uses to with its personnel? Is there a problem with nonprofit executive salaries? Over the past few months, the YMCA has made significant economic proposals that protect the interests of our employees, as well as the long-term sustainability of the YMCA. We continue to use our best efforts to reach an agreement with the union, and both sides will be back at the bargaining table Monday. 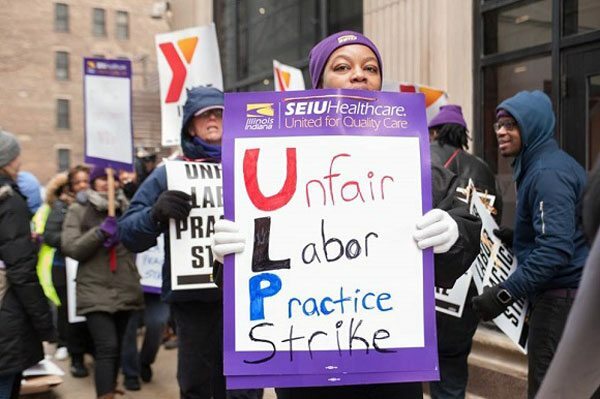 Given that negotiations are ongoing, we were surprised that SEIU leaders decided to call a one-day strike by YMCA union employees on Thursday, March 1st. Because of SEIU’s decision, the YMCA was forced to cancel Early Education and Care programs today, as well as some School Age programs, resulting in disruption of services to the families in our programs. We remain committed to providing quality programs and services for children and families in our community and look forward to a prompt resolution of this agreement. Though the Y’s pay scale for its childcare staff is consistent with the labor market for childcare staff in Chicago, it does not seem to be aligned with the organization’s goal for those it serves, “building stronger and healthier communities [and] more vibrant and compassionate neighborhoods where the Y is seen as an essential leader in making our city a world-class place to live and raise a family.” The Y, like many nonprofits, finds itself forced to operate its services under great economic stress. The current level of funding does not provide the funds needed to raise salaries significantly and there appears to be little interest from government, foundations, and other donors to ease this dilemma. Yet, as this one-day labor action well illustrates, there is a service cost to seeing employees differently than clients. NPQ found the same issue when it covered the nonprofit sector’s challenge to the Obama administration’s proposed changes to the overtime eligibility standards. Shelving the new rules and saving some dollars by not paying overtime…will solve an immediate threat, but it maintains the sector in a “stuck” place financially, one that belies the credibility of the sector. If federal, state, and local governments that depend on nonprofit organizations to deliver critical services are not willing to deal with wage justice and the overall funding problems that flow from government contracting, we are essentially agreeing to instability and subjugation for our organizations and those who work for them on the front lines.